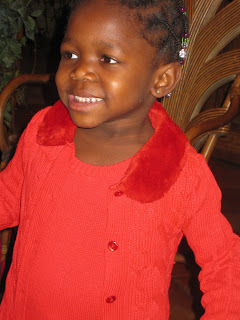 A year after we brought Alia home, I was back in Liberia to bring home our newest son, who was 5 months old at the time. While there, we found out that Aiden's family had put his older sister in the orphanage. I went to meet her while I was there and called Steve asking him to pray; we had to find a way to bring her home also. We would have never knowingly separated siblings, and now we had spent all our money to bring home Aiden. We prayed and begged for help to go back for Joeliana. God and family and friends were amazingly gracious, and with prayer and much help, Steve went back in the summer and brought home a very sick little two year old. With good nutrition and life giving medical care, Joeliana is now a very healthy, very active and a lot playfully naughty girl of three. Each child in our home has been a blessing and a "remembrance" of God's love, mercy and faithfulness. Each had deepened our faith, hope and walk with the LORD. Each child has their own story, and by God's grace, we get to be apart of it. I often tell my children, "I'm so glad God gave you to me." I know that they appreciate me...one day I fell off a ladder, and one of them laughingly (while I was NOT laughing, but hurting), said "OH NO, if mom gets hurt we wont have any good food to eat any more!" Thank you for sharing your story! My husband and I are adopting too. We chose Haiti. I love that I found this blog. My husband and I would love to have a big a family as God sees fit for us to have. I can't wait to hear more about how daily life runs for your family. Oh we homeschool also. Thanks for posting!